'Lava firehose' created by volcano Jump to media player Dramatic footage shows the unusual phenomenon as lava flows through a crack in a sea cliff. Lava pictures from 'smiling' Hawaiian volcano Jump to media player The Kilauea volcano in Hawaii has erupted, however the volcano appears to be "smiling"
Hawaii's Kilauea volcano close-up Jump to media player Footage released by the US Geological Survey has been released of the lava lake on top of Hawaii's Kilauea volcano. Kilauea volcano's incredible lava lake eruption Jump to media player New footage of the eruption of Kilauea volcano in Hawaii, as it spews molten rock into giant lava lakes, has been released by the United States Geological Survey. 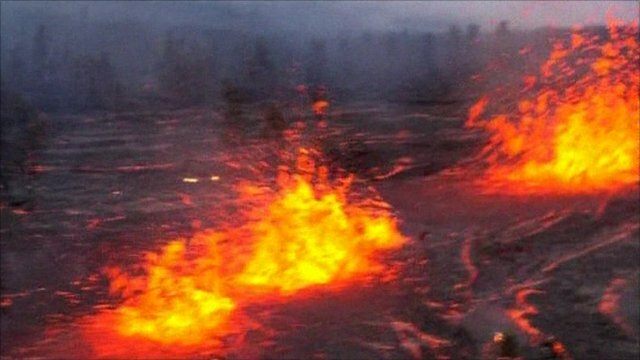 Fears over lava levels at Hawaii volcano Jump to media player Spectacular pictures of a volcano in Hawaii have been released by the US Geological Survey. Hawaiian volcano's violent eruption Jump to media player The Kilauea volcano on the Big Island of Hawaii has erupted, spewing fountains of lava into the air. 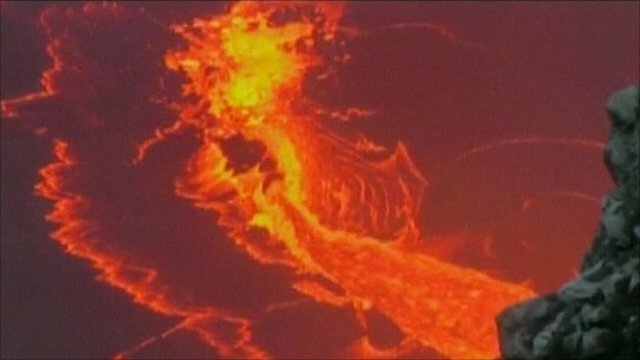 The Kilauea volcano in Hawaii has been active since 1983, but scientists have filmed an unusual phenomenon. Dramatic footage shows lava as it flows through a crack in a sea cliff, and into the Pacific Ocean.